Stock photo of hams hanging to dry at a market stall during a Medieval Festival in Plaza de la Corredera, City of Cordoba, UNESCO World Heritage Site, Province of Cordoba, Andalusia (Andalucia), Spain, Europe. Hams hanging to dry at a market stall during the Medieval Festival in Plaza de la Corredera. 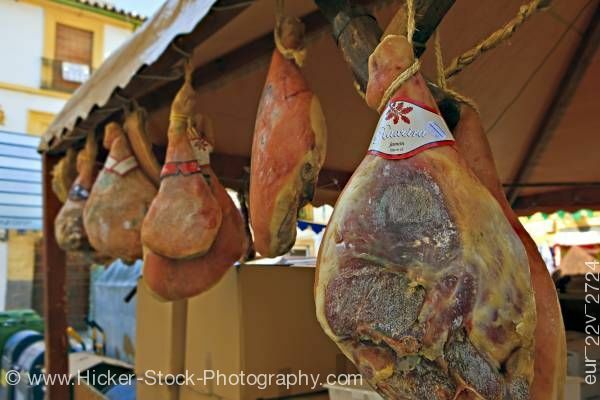 This stock photo shows drying hams hanging at a market stall during a Medieval Festival in Plaza de la Corredera, City of Cordoba, UNESCO World Heritage Site, Province of Cordoba, Andalusia (Andalucia), Spain, Europe. During a Medieval Festival in the Plaza de la Corredera, hams hang to dry at a market stall. The hams hang along the bottom of the roof along the wood frame of the open market stall. Thick twine is wrapped around the less meaty part of the bone with the larger meatier part of the ham hangs below for drying. A label is attached around the smaller area of meat. A few boxes are stacked just beyond the hams. Hams hanging to dry at a market stall during a Medieval Festival in Plaza de la Corredera, City of Cordoba, UNESCO World Heritage Site, Province of Cordoba, Andalusia (Andalucia), Spain, Europe.